Leftovers tend to pile up at my house, but these Low-Carb Turkey Picadillo Lettuce Wraps were gone the next day! 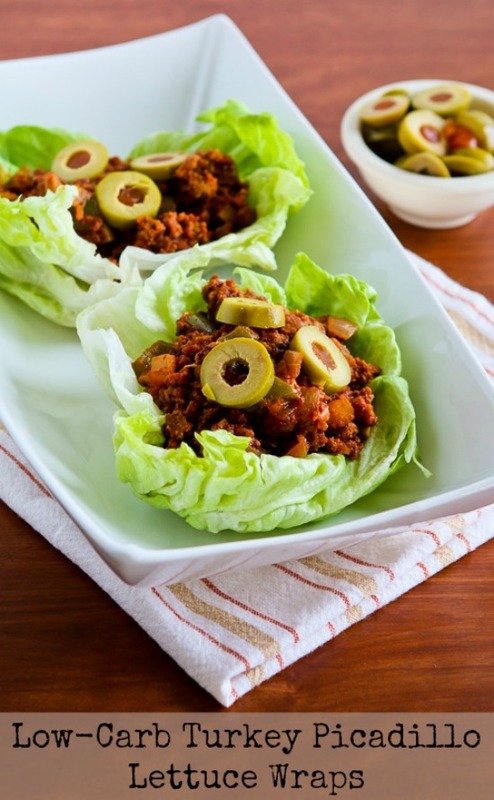 These delicious lettuce wraps with ground turkey, bell pepper, tomato sauce, and green olives are also low-glycemic, gluten-free, dairy-free, South Beach Diet friendly, and can easily be Keto, Paleo, or Whole 30 with the right ingredient choices. Use the Diet-Type Index to find more recipes like this one. 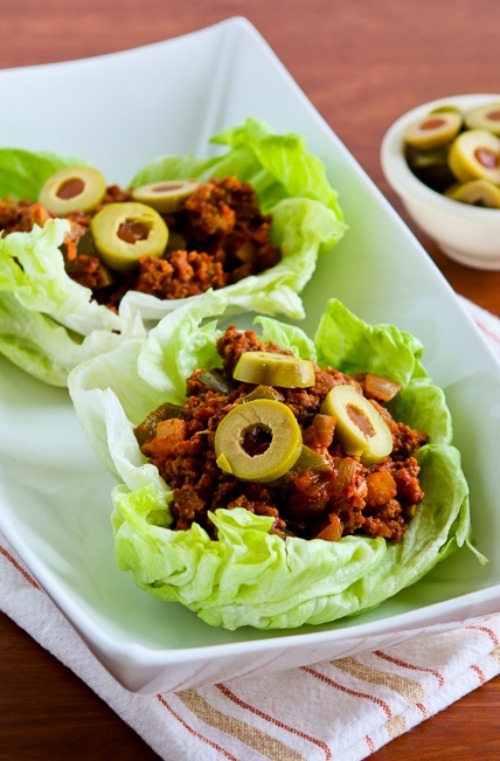 Click here to PIN Low-Carb Turkey Picadillo Lettuce Wraps! I’m spotlighting some of my favorite low-carb recipes along with new ones for the first few weeks of January, and these Low-Carb Turkey Picadillo Lettuce Wraps are easy and delicious! I’m a firm believer that you can never have too many recipes for lettuce wraps, and they’re something I always enjoy when I’m focused on really low-carb eating. Through the years I’ve made so many lettuce wrap variations that I’d have a hard time choosing a favorite, but these Low-Carb Turkey Picadillo Lettuce Wraps were definitely amazing. Ground turkey (or ground beef) is simmered with onion, green pepper, tomatoes, chicken stock, and spices, with some chopped green olives and a generous amount of Green Tabasco Sauce giving it just enough zip to make it interesting. The word Picadillo comes from a Spanish word that means “to mince” and many countries have their own version of this ground meat dish, but the use of olives makes this recipe lean towards Cuban Picadillo. If you’re eating Keto, you may wish to use higher-fat ground beef in place of the ground turkey; that will be equally delicious. And if you use an approved hot sauce, this recipe can easily be Paleo or Whole 30 approved as well. Heat a little olive oil and saute the ground turkey until it’s starting to brown. Then push the meat over, add a tiny bit more oil, and add the chopped onion and green bell pepper. Keep cooking until the onions and peppers are soft and starting to brown. While the veggies cook, chop up 1/2 cup Spanish green olives, plus some slices to garnish the lettuce wraps if desired. Add the chicken stock, crushed tomatoes, ground cumin, ground coriander, salt and papper, and let the mixture simmer on low heat about 20 minutes, or until most of the liquid has evaporated. When there is only a small amount of liquid left in the pan, stir in the chopped green olives, green olive brine, and Green Tabasco sauce, and about 10 minutes more. The pan should be nearly dry if you push the meat aside, otherwise the lettuce wraps will be too messy. While the meat cooks, prepare the lettuce by removing damaged outer leaves and cutting away the core. I like to cut the lettuce in half and then pull away several pieces at once to make a double thickness of lettuce to hold the juicy filling. Serve hot, with sliced green olives to garnish if desired. These delicious lettuce wraps with ground turkey, bell pepper, tomato sauce, and green olives make a great summer dinner! Heat 2 teaspoons olive oil in a large non-stick frying pan. Add the turkey, and cook over medium heat until it’s starting to brown, about 6-7 minutes. Push the meat over and add the other 2 teaspoons of oil (or as needed). Add the chopped onion and green bell pepper, and continue to cook, turning occasionally, until the onions and peppers are soft and starting to brown on the edges. Add the chicken stock, crushed tomatoes, ground cumin, ground coriander, and salt and pepper to taste and simmer over low heat until the liquid has mostly evaporated, about 20 minutes. When there is only a small amount of liquid left, stir in the Green Tabasco sauce, chopped green olives, and green olive brine, stirring to combine all the ingredients. Cook about 5-10 minutes longer, or until the pan is nearly dry. While the meat is simmering, peel off any damaged out leaves of lettuce, cut away the core, and cut the heads in half. To serve, peel off a double layer of lettuce to form a cup, fill with the hot meat mixture, garnish with green olive slices, and eat! If this makes more than you’ll eat at one time, just refrigerate the filling and the lettuce leaves separately, then heat the Picadillo mixture in a small pan or in the microwave when you want to eat the leftovers! Broth from a can if always fine, but I’d use 1 2/3 cups homemade chicken stock if you have some. I love Green Tabasco sauce and that’s what I’d definitely use here, but you can probably use another hot sauce with good results. Recipe inspired by a recipe in Food and Wine’s Quick from Scratch One-Dish Meals Cookbook. Everything in these Low-Carb Turkey Picadillo Lettuce Wraps is great for low-carb or Keto diet plans, although you may wish to use higher-fat ground beef instead of turkey for Keto. With the right ingredient choices this can easily be Paleo or Whole 30. And as long as you use lean ground turkey, this would be approved for any phase of the South Beach Diet. I like the use of lettuce cups to replace taco shells but adding slices of jalapeno on top will make this taste better for me 🙂 Spicy!!!!! Hi Sting, so glad you enjoyed! WOW, made these tonight. So tasty. All I added to the recipe was a dash of smoked chipotle chil pepper. My wife gave me two thumbs up. In will definately make this again. Nadine, so glad you liked it as much as we did! I made this tonight. It was delicious–and very easy to put together. The whole family loved it. I can't believe it was so healthy too. We ate with a quinoa/brown rice mix. Jeanette, I love all these ingredients! And I think it's a great idea to have it in stuffed peppers! I still haven't tried making picadillo although I have all the ingredients to make this so no excuses. Bet this would be great in stuffed peppers too.